Do you have a youngster who just can't get enough 'Shark'??? 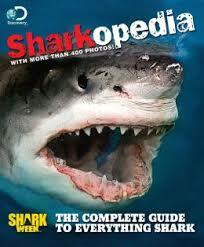 Or maybe you watched the recent SyFy movie Sharknado and now want to learn about 'real' sharks. Whatever the reason, you should enter this month's book giveaway contest to win a brand new copy of the Discovery Channel's new book Sharkopedia. We gave this book a 5-Star review on Feathered Quill Book Reviews and now it's your chance to win a copy. It takes less than a minute to enter (really, less than a minute) and we don't collect names/emails from the entrants. What are you waiting for? Enter now!